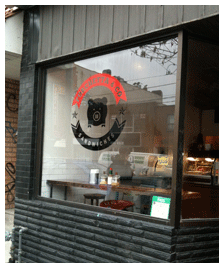 Had a delish pork sandwich-to-go the other day at PORCHETTA & CO on Dundas @Palmerston (just west of Bathurst). Simply roasted meat with grainy mustard and a splash of hot sauce. The side orders of beans and rapini were fab too. This charming hole-in-the-wall has nailed its precise concept. Do one thing and do it well. Check it out.